While on a ride in Turkey several years ago for RoadRunner Magazine I met Dan Moore, an accomplished entrepreneur from Cleveland. Dan’s an irrasible, irreverant, charming 70 year old with more potential for trouble and excitement than half a dozen 14 year old boys. He’s also managed to create more high-value businesses than anyone I’ve ever met, and I’ve met a few. 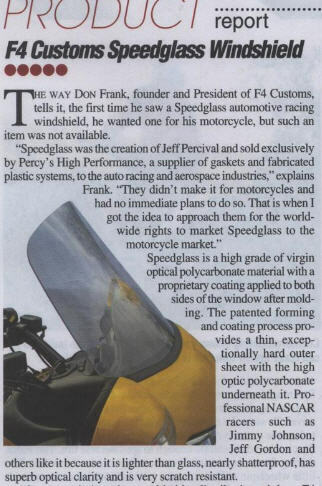 Six months after our ride he called me about his friend, Don Frank, who had created a company to build and sell high quality motorcycle windshields. Don sent me one, I put it on my bike and used it for 18 months. It is pretty incredible. Here is the review I wrote about it which appears in the December, 2009 issue of Motorcycle Consumer News.